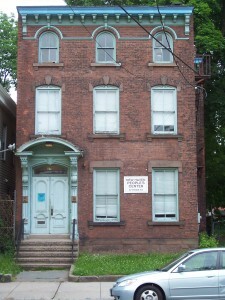 The New Haven People's Center is on track to receive city, state and federal funding for renovations. New Haven, Conn. – The Board of Alderman voted this month to allocate $25,000 in federal funds for a nonprofit to renovate its building despite the organization’s links to the Communist Party USA. Connecticut taxpayers will contribute an additional $300,000 if the State Bond Commission votes as expected to approve the funding Monday. According to city records, the New Haven People’s Center needs $302,420 to fix its building, 37 Howe St. Two-thirds of the money will go toward masonry repairs. The center also plans to repair its roof, install new windows and upgrade its heating system. If the center receives both the city and state funding, it will have more than $20,000 left over after completing its renovations. The People’s Center is run by Progressive Education and Research Associates, a nonprofit headed by officials in the Connecticut chapter of the Communist Party USA. Joelle Fishman is coordinator of the center and chairman of the state Communist Party. She is also the Connecticut correspondent for People’s World, the Communist Party USA newspaper, which houses a local bureau at the New Haven People’s Center. The group’s Communist ties are well-known by state officials. “I know that Joelle Fishman is a Communist,” Office of Policy and Management Undersecretary Gian-Carl Casa said in an email. Despite being prepared to spend $300,000 plus interest to fund renovations at the center, the state has no documentation to support the grant because it is a legislative earmark supported by state Sen. Toni Harp, D-New Haven. A retired state employee also warned Gov. Dannel Malloy, whose administration supports the funding, that the agency should not receive state money. The $25,000 in federal funding comes in the form of a Community Development Block Grant, a program of the U.S. Department of Housing and Urban Development. The agency is expected to give more than $3.5 billion in block grants this year. New Haven is considering another $50,000 in funding, but it has not identified a funding source yet, according to a spokesman. Taxpayer money (state or federal) should not be used to support a group associated with a political movement that is categorically opposed to free market capitalism which is the backbone of our economy and has enabled us to occupy a sustained position of world leadership. Let them raise their own funds through their own membership and not rely on monies enabled by bonding and taxpayer supported subsidies when there are much more worthy programs actually representing the interests of Americans that would make better use of the money. Tax exempt status shouldn’t be seen as justifying access to public financing. The group’s tax-exempt status is going to be challenged as is New Haven’s use of federal funds to subsidize the communist party building. Watch for it…it ain’t over yet. The real issue is can the state afford to continuously bond more and more projects. The state’s current bonding debt is well over $19.5 BILLION dollars. That is debt that must be paid down. If this organization is so worthy why haven’t they explored fundraising, bake sales, dollars donated towards bricks, etc. If they have the capacity to operate would a bank provide them a loan to renovate their building. Then if they rent a portion of their buiding out they can collect rent and pay the loan back. Have they explored CHEFA funds. If the City feels it is such a good building why hasn’t the City stepped in with more funds for their renovations instead of coming to the state for the entire state taypayers to pay the debt on this building. The taxpayers cannot support the continuation of bonding debt regardless of which political party is in favor of the debt. Young people are leaving the state, people can’t find jobs so who is going to pay this debt down. It is time to address the GREAT BONDING DEBT and limit projects to truly necessary ones such as health, safety, roads, etc. Connecticut’s borrowing debt needs to be addressed sooner than later. We should not place the burden of paying this debt off to our children and grandchildren.